A while ago I built a computer input device using a laser pointer and regular usb web camera. It was a pretty simple setup, and I used a lot of existing tools as a jumping off point. Here’s a writeup of my work and details for how to replicate it and what I learned. Technically speaking, the laser is completely optional. In fact, during testing I just had a desktop computer with the camera pointed at a sheet of paper taped to a wall, and I drew with the laser pointer on that sheet of paper and used that as an input device. With the projector, you can turn the setup into a more direct input, as your point translates directly to a point on a screen. But that’s just a bonus. This can be done without the projector. Take the camera, point it at something. Shine the laser inside the area where the camera can see. That’s it in a nutshell. However, there are some additional considerations. First, the more direct the camera, the more accurate it will be. If the camera is off to the side, it will see a skewed wall, and because one side is closer than the other, it’s impossible to focus perfectly, and one side of the wall will be more precise than the far side of the wall. Having the camera point as directly as possible at the surface is the best option. Second, the distance to the surface matters. A camera that is too far from the surface may not be able to see a really small laser point. A camera that is too close will see a very large laser point and will not have great resolution. It’s a tradeoff, and you just have to experiment to find the best distance. Third, if using a projector, the camera should be able to see slightly more than the projected area. A border of a few inches up to a foot is preferable, as this space can actually be used for input even if it’s not in the projected space. Fourth, it’s important to control light levels. If there are sources of light in the view of the camera, such as a lamp or window, then it is very likely the algorithm will see those points as above the threshold, and will try to consider them part of the laser pointer (remember white light is made up of red, green, and blue, so it will still be above the red threshold). Also, if using a projector, the laser pointer has to be brighter than the brightest the projector can get, and the threshold has to be set so that the projector itself isn’t bright enough to go over the threshold. And the ambient light in the room can’t be so bright that the threshold has to be really high and thus the laser pointer isn’t recognized. Again, there are a lot of tradeoffs with the light levels in a room. http://java.sun.com/javase/technologies/desktop/media/jmf/2.1.1/download.html Java Media Framework (JMF) 2.1.1e – This is used for capturing the individual frames of the camera. https://jai.dev.java.net/binary-builds.html Java Advanced Imaging (JAI) – This is used for doing the affine transforms that translate from camera coordinates to another coordinate system. The JAI library is not entirely essential, as you could decide not to translate your coordinates, or you could perform your affine transform math to do it and eschew the large library that will go mostly unused. The neat thing about this transform, though, is that it allows for the camera to be anywhere, and as long as it can see the desired area, it will take care of transforming to the correct coordinates. This is very convenient. The JMF library exists for Windows, Linux, and Mac. I was able to get it working in Windows, but wasn’t able to get it completely working in Linux (Ubuntu Jaunty as of this writing), and I don’t have a Mac to test on. The basic theory behind the project is the following; a laser pointer shines on a surface. The web camera is looking at that surface. Software running on a computer is analyzing each frame of that camera image and looking for the laser pointer. Once it finds that pointer, it converts the camera coordinates of that point into screen coordinates and fires an event to any piece of software that is listening. That listening software can then do something with that event. The simplest example is a mouse emulator, which merely moves the mouse to the correct coordinates based on the location of the laser. Laser On: the laser is now visible but wasn’t before. Laser Off: the laser is no longer visible. Laser Stable: the laser is on but hasn’t moved. Laser Moved: the laser has changed location. Laser Exited Space: the laser is still visible, but it no longer maps inside the coordinate space. For most of these events, the raw camera coordinates and the transformed coordinates are passed to the listeners. The listeners then do whatever they want with this information. Calibration is really only necessary if you are using the coordinate transforms. Essentially, the calibration process consists of identifying four points and mapping camera coordinates to the other coordinates. I wrote a small application that shows a blank screen and prompts the user to put the laser point at each of the prompted circles, giving the system a mapping at known locations. This writes the data to a configuration file which is used by all other applications. As long as the camera and projector don’t move, calibration does not need to be done again. Here is a video of the calibration process. Here is the camera.zip (3.7mb). It includes the JAI library, the base laser application, the calibrator, and an example application that just acts as a mouse emulator. Below are a couple snippets of the important stuff. This first part is the code used to parse each frame and find the laser point, then fire the appropriate events. * Callback to access individual video frames. This is where almost all of the work is done. This next part is pretty standard code for adding event listeners. You can see which laser events are getting passed. I intentionally made it similar to how mouse listeners are used. This algorithm is extremely basic and not robust at all. By just averaging the points above the threshold, I don’t take into consideration if there are multiple lasers on the screen. I also don’t filter out errant pixels that are above the threshold by accident, and I don’t filter out light sources that aren’t moving. A more robust algorithm would do a better job and possibly identify multiple laser pointers. I’m not the first person that has done this, though from what I can tell this is the first post that goes into so much detail and provides code. I have seen other people do this using other platforms, and I have seen other people try to sell this sort of thing. In fact, this post is sort of a response to some people who think they can get away with charging thousands of dollars for something that amounts to a few lines of code and less than $40 in hardware. Something I’d like to see in the future is a projector with a built in camera that is capable of doing this sort of thing natively, perhaps even using the same lens system so that calibration would be moot. You may have seen references to it in this post already, but one thing I mention is having the camera see outside the projected area and how that can be used for additional input. Because the laser pointer doesn’t have buttons, its input abilities are limited. One way to get around this is to take advantage of the space outside the projected area. For example, you could have the laser act as a mouse while inside the projector area, but if the laser moves up and down the side next to the projected area it could act as a scroll wheel. In a simple paint application, I had the space above and below the area change the brush color, and the sides changed the brush thickness or changed input modes. This turns out to be extremely useful as a way of adding interactivity to the system without requiring new hardware or covering up the projected area. As far as I can tell, I haven’t seen anyone else do this. I have seen laser pointers with buttons that go forward and backward in a slideshow and have a dongle that plugs into the computer. These are much more expensive than generic laser pointers but could be reused to make the laser pointer much more useful. Just like a new mouse takes practice, the laser pointer takes a lot of practice. Not just smooth and accurate movement, but turning it on and off where you want to. Typically releasing the power button on the laser pointer will cause the point to move a slight amount, so if you’re trying to release the laser over a small button, that has to be considered so that the laser pointer goes off while over the right spot. This was a cool project. It took some time to get everything working, and I’m throwing it out there. Please don’t use this as a school project without adding to it. I’ve had people ask me to give them my source code so they could just use it and not do anything on their own. That’s weak and you won’t learn anything, and professors are just as good at searching the web. If you do use this, please send me a note at laser@bobbaddeley.com. It’s always neat to see other people using my stuff. If you plan to sell this, naturally I’d like a cut. Kharma behooves you to contact me to work something out, but one of the reasons I put this out there is I don’t think it has a lot of commercial promise. There are already people trying to, and there are also people like me putting out open source applications. If you try to patent any of the concepts described in this post, I will put up a fight. I have youtube videos, code, and witnesses dating back a few years, and there is plenty of prior art from other people as well. We had an interesting problem at work. There’s a display in the main lobby of my building that shows the calendar of all the conference rooms and a map showing where they are in the building. It’s pretty handy for visitors and looks really slick. The problem, though, is night. There’s no point in having the display running 24/7. But the TV has a flaw where it won’t go into sleep mode when the HDMI cable is plugged in, even if the computer itself is asleep and there isn’t a signal. The solution so far has been for a select few to turn it on in the morning when they arrive and off when they leave. Naturally, this isn’t a sustainable or reliable solution, as it doesn’t take a lot for the system to break down. So Ian brought me in on the problem to see what I could do with it. I thought about some existing options. 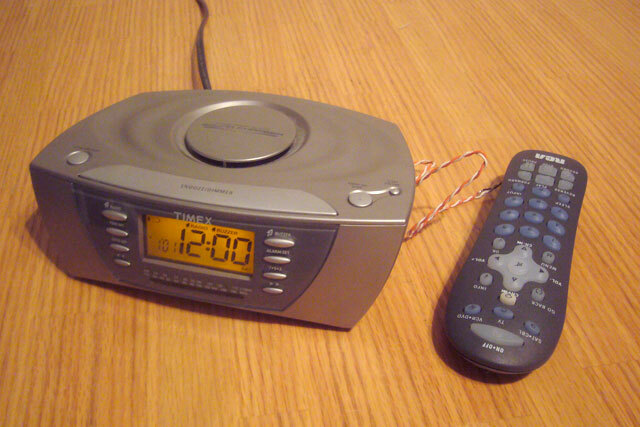 An outlet timer would work for turning it off in the evening, but not for turning it on in the morning (it would give the TV power, but not turn it on). I even found an alarm clock that was capable of being programmed to turn on and off a TV, which was really close to what we wanted, but it was discontinued, and reading into the manual it looked like it wasn’t going to work anyway. I realized I would have to build something. I started off thinking of building off of the Arduino microcontroller board, which I’ve used for other projects and really enjoy using. I spent a day working on hooking up an infrared LED and trying to get it to output a standard on/off signal that the TV would recognize. I also tried to hook up an LCD screen and buttons for configuring the timer, but I quickly got frustrated as each part took way longer than I wanted, and wasn’t getting anywhere. It made a lot more sense to work with existing electronics and cobble something together. It turned out I already had an alarm clock that I had stopped using in favor of my cell phone, and the alarm clock had two configurable alarms on it. And Ian had purchased for me a cheap universal remote. So I just had to get the alarm clock to trigger the remote control. This was easier said than done. 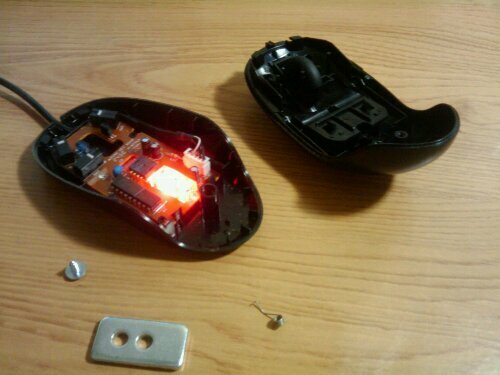 First I took apart the remote control. 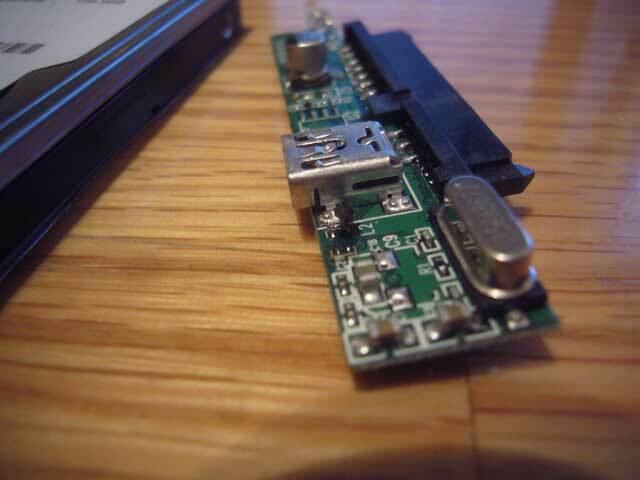 I followed the traces back from the on/off button and soldered a couple wires to them, then fed them out the back of the remote through a hole where the battery cover was. Next, I opened the alarm clock and went about trying to identify triggers I could use to determine the alarm state. I was hoping for something simple, like one node being +5V when the radio alarm was on and a different node being +5V when the buzzer alarm was on. Sadly, there was no such luck. I’ll spare most of the details, but I never found a clean signal I could use. I ended up taking the radio alarm, cutting out the speaker, turning the volume all the way up, and using the speaker wire to drive two relays, which triggered the remote, then also fed to the alarm reset button. That way the radio would turn on, the signal would trip the remote, and it would reset the alarm. That one worked pretty slick. It was even harder for the buzzer alarm. Not only could I not find a signal, but it didn’t go to the speaker, either. It went to a separate piezoelectric speaker, and the voltage to it wasn’t enough to trip the relays. So I had to build an amplifier circuit that bumped the signal up to something that would trip the relay. But then there was another problem. It was tripping the alarm reset button faster than it was tripping the remote, so it’d reset the alarm before the remote control had a chance, and the TV wouldn’t ever get switched. I fixed this by putting in an RC delay circuit on the alarm reset relay. I put it all back together and tested it out. It’s in my apartment, so I had to try it out on the VCR (I had to take it out of its box), but it worked. The alarm clock dutifully turned off and on the VCR at the right times. I’m bringing it in to work tomorrow to see if it’ll work on the intended television. It’ll probably sit on a counter across the lobby and point at the TV, and definitely have a sign that says what it is so people don’t get suspicious. Here’s a picture of the completed project. I won’t show the insides because I’m a little embarrassed of the circuit. I could have done a much cleaner and more correct design, but it works now, so I’m happy. I hope people at work appreciate it, too. A few days ago at work it was snowing. I don’t have a window in my office, so I was getting regular updates on the rate of snowfall by more privileged coworkers. The terms they used were wildly inconsistent, though, and I thought there had to be a way to determine the actual rate of snowfall that wasn’t “kinda coming down softer now.” So I ran a little experiment. I took a black piece of paper and taped it outside in the courtyard. Then one coworker with a camera and a view of the courtyard hooked the camera up so that it was looking across the courtyard at the black piece of paper. I wrote a little bit of software that would take the image, analyze the part with the black paper, and see how many pixels were above a given threshold. The theory was that the varying levels of snowfall would block the paper as the snow fell. In other words, the falling snow would appear as white spots on the camera in front of the black paper. Then I could just count the number of white spots at any given second and have a number that represented the rate of snowfall at any given time. Sadly, the weather made a mockery of my experiment and by the time I had set it up and was ready to test, it had stopped snowing. Still, it was fun to try out, and I think it was working correctly and just needed some tweaking, though the importance of such a task in the grand scheme of things is right up there with grooming shag carpet or arranging my spice cabinet by region of origin. With the projector in my apartment, I have a VGA cable and an S-Video cable running as inputs. However, my Playstation2 cable only has composite video output. 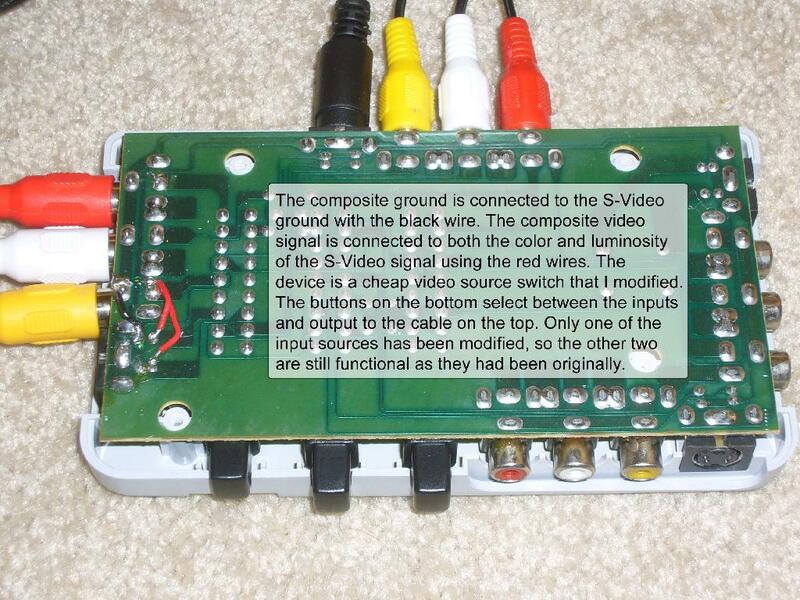 It turns out that composite can be hacked into s-video fairly easily. By running the composite video signal to both the brightness and color parts of the s-video you get a usable video feed. It’s not great quality, but it’s better than nothing. I also managed to find a Playstation2 cable that had s-video out, so it’s no longer an issue, but for a while I needed a solution.